The ship to ship transhipment (STS) at anchorage of Eleusis (Greece) of bulk soya bean and bulk cornex distressed vessel MV Boreas liner in to our vessel MV Magda P. Delivery to the original Turkish port of destination. 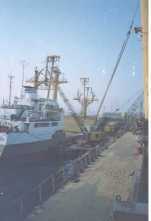 Transhipment Carried out using portablevacuvators and floating crane. All systems and logistics planned and carried out by our own master mariners. 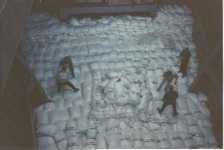 MV Boreas ship to ship transhipment of 40.000 tons of corn. The ship to ship transhipment (STS) at Piraeus of bagged sugar ex distressed vessel MV Alliki a liner in to our vessel MV Express Aberdeen and delivery to the original port of destination (UMM – QASR – IRAQ). 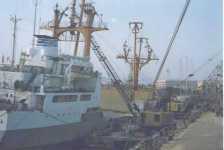 All systems and logistics originated and executed by our own qualified marine personnel. MV Alliki ship to ship transhipment of 11.000 tons of sugar. MV Berga Pride to MV Akti Ship to ship transhipment of 21.000 tons of rise bran. 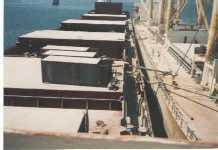 The ship to ship transhipment (STS) at Piraeus of bagged sugar from ex distressed vessel M/V Aliki into our vessel M/V Express Aberdeen and delivered to the original port of destination (UMM- QASR-IRAQ) all systems and logistics originated and executed by our own qualified marin personel. The ship to ship transhipment (STS) at anchrage of Eleusis (Greece) of bulk soya bean and bulk corn from ex distressed vessel M/V Boreas into our vessel M/V Magda P delivered to the original Turkish port of destination. 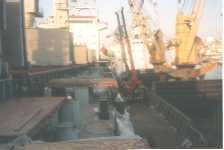 Transhipment carried out using portable evacuvators and floating crain. 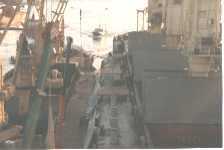 All systems and logistics planes and carried out by our own master mariners.